As to-day is not a day of fasting, there is no collecta previous to the stational procession, this procession being a rite of a distinctly penitential character, and therefore not in keeping with the Sunday festival. St. Peter’s is the ancient liturgical cathedral of the Roman Pontiffs, who repair there to officiate on all the great festivals, but the habitual seat, the normal residence of the Popes, is the Lateran, and for this reason the Basilica Salvatoris (St. John Lateran) can claim the title of Mother and Head of all the churches of the city and of the world. In the Mass for this Sunday great prominence is given to Psalm 90 that psalm which was quoted by Satan when tempting Our Lord. 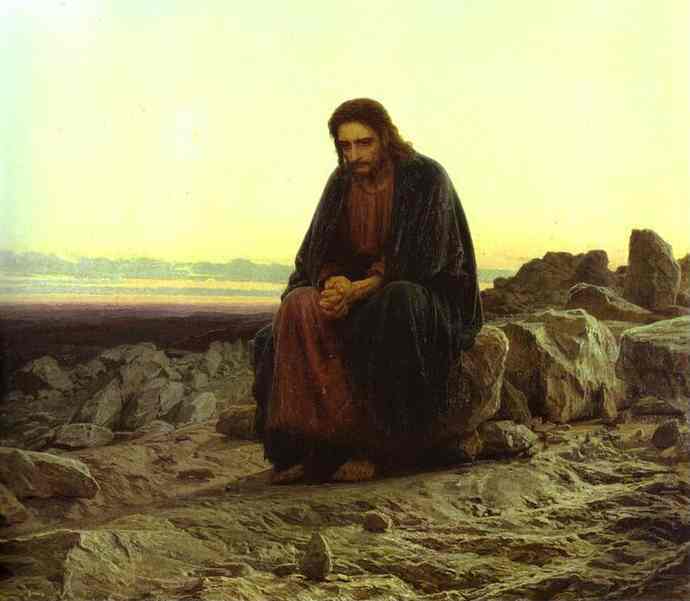 The faithful should contemplate with special devotion the mystery of Christ tempted in the desert, for there is no other which shows more clearly how the divine Providence makes even the wiles of the devil serve to our sanctification. Although the faithful have already been fasting for four days, it is only to-day that the Liturgy celebrates the beginning of Lent, for until this Sunday nothing has been changed either in the divine Office or in the Mass. The proper Preface and other prayers are now used and the Lenten forms are followed in the divine Office. In the ancient Roman Rite, the faithful on Ash Wednesday approach the Communion rail before Holy Mass to receive ashes (from the blessed palms/foliage of the previous year) on their foreheads in the form of a cross. The priest as he administers the ashes says, “Remember man that thou art dust and unto dust thou shalt return” (Meménto, homo, quia pulvis es, et in púlverem revertéris). The custom of distributing the ashes to the faithful arose from a devotional imitation of the practice observed in the case of public penitents. Although it is not a holy day of obligation, receiving the ashes is a worthy manner of beginning the season which liturgically-speaking begins on the First Sunday of Lent. The words of the Introit of Ash Wednesday are a wonderful reminder of what God does during this season of Lent: “Thou hast mercy upon all, O Lord, and hatest none of the things which Thou hast made, overlooking the sins of men for the sake of repentance, and sparing them: because Thou art the Lord our God” (our emphasis). Click below to the left to listen,however, first please put the background music from Sonific Song Spot below and to the lower left on pause. But lest you think this sermon is intended solely for the catechumen, we must scrutinize ourselves still more. We, who have received the divine indwelling in our Baptism so long ago, and have been so frequently a partaker of our divine Paschal Lamb, the reception of whom but a few times made great saints out of St. Maria Goretti, for example, and Bl. Imelda who died of love at her First Holy Communion. How do we stand in our attempts to “defeat the devil with all his works and pomps?” If we neglect this struggle, and leave our own interior castle empty of virtue and sanctity, the gospel tells us we will wind up 7 times worse, which is readily verifiable in so many fallen away Catholics and once Catholic countries. Let us then review who the devil is and what are his works and pomps. The devil you will recall is an angel, created by God. Indeed he was the highest of angels. He was created good, and as a creature depended entirely on God to exist and to act. He scorned this dependence however, and would not serve. Why? There are different opinions, as there is little revealed about it other than it was due to pride. Some of the Fathers and Schoolmen, however, give this for a reason, namely- he was shown a mystery far above even his own angelic understanding, that is, the mystery of the Incarnation, wherein God would assume human nature and not an angelic one, the nature of a rational-animal. And in this he was shown as well the mystery of the Mother of God, who as a mere human being would be placed above all the angels including himself the highest Seraph, in glory. This was something seemingly backwards as indeed in the angelic order, the more endowed the nature of an angel was the higher degree of glory it received in the supernatural order. Nature and grace were proportionate. But God chose the weak things of this world to shame the strong both here and in the world above, to show that it is all His gratuitous gift, that everything is grace. But this Satan could not accept. He would not stoop down to obey and serve a mere human being. He would try rather to be like God without God. How foolish indeed! And so he fell “and his tail drew the third part of the stars of heaven” away with him, the Apocalypse tells us, which is often interpreted as referring to the fall of the angels, the number of which were many. This leaves many empty seats in heaven, which St. Thomas tells us, expressing a common tradition, are to be filled up by mankind, which causes even greater resentment of the fallen angels toward us. For, they are condemned to hell for all eternity, which they chose by loving themselves more than God. And misery loves company. They are forever fixed in their hatred for God, who would place a mere human being above them. But they know quite well that they cannot harm God in any way, so they are left to make every effort to efface his image and likeness, and pervert the order that he has established on earth, where they prowl about seeking the ruin of souls. So what exactly can they do to us? The Scriptures and the Liturgy remind us that we are slaves of the devil, the prince of this world, by our sin, and the Church takes great care to exorcize even infants who are about to be baptized. What is the meaning of this? It is to say that due to original sin, and our consequent disordered desires we will not be able to avoid sin without the grace of God, and so we are doomed to failure, doomed to everlasting hell. Yet we are not utterly corrupt as Luther and Calvin thought. And not everything the pagan does is a sin. We do retain our free will and the devil cannot make us do anything. What he can do though, is propose images and words to our imagination, stir up our passions, and arrange external temptations, through his powerful influence, or even by some extraordinary / preternatural activity, as we see in the lives of St. John Vianney and St. Padre Pio, who were often beat up by the devil. The former even had his bed set on fire by the devil. And if people involve themselves in the occult, like Ouija boards, Tarot cards, satanic music, (and you’d be surprised to hear the names of the number of bands who were so involved in the occult and incorporated such occultism into their music, like the Beatles, the Rolling Stones, the Eagles, and other so called “light” rock bands), they can even open themselves up to full diabolical possession in which they lose control over all their motor faculties- speech, movement, etc. The demons are pure spirits and have a virtually unlimited power over matter. They could destroy the world in a matter of moments, as there is nothing to hinder the exercise of their power over it, as such. But they wish not to simply destroy the physical world. They’d rather make use of it to destroy your immortal soul. What will be the plan of attack? Based on what we said, remember that they eternally resent you, as a bodily creature, as part animal, called to stand above them- pure spirits. And so they will make every effort to tempt you to an animal like existence, by tempting you to worship your body, to indulge in sensuality, to eat, drink and be merry inordinately, seeking nothing higher than sensual gratification; to cause you to spend most of your time preoccupied with games, sports, fashion, food, toys, cars, hunting, fishing, and all the other good things of this world, which are meant to be used to serve and love God rather than replace Him, whereas the devil wants us to worship them, and place our happiness therein. He will encourage especially immodest clothing, music, and media which are centered on unbridling the passions, which being undone cause souls to fall into hell as fast and numerous as snowflakes, as our Lady of Fatima told us. How then can we stand against such an enemy? First let us recall that these wicked spirits are held in existence in every moment by the hand of God, in whom, like every other mere creature, they live and move and have their being. And thus all their activity, is entirely subordinate to His Providence, which activity he permits to strengthen and prove the just in combat, or punish the evil for their sin, who will glorify His divine justice in the end. And how are we to pass this test? First, there are the sacramentals that the Church gives us- holy water, the sign of the Cross, exorcised salt, scapulars, the Miraculous Medal, the very powerful Medal of St. Benedict, which contains an exorcism on it. There are also general exorcism prayers that the laity can say, invocations for deliverance by the power of the Most Holy Names of Jesus and Mary; invocation to St. Joseph the Terror of Demons and to St. Michael his ancient foe who cast him out of heaven, although as of 1984, by Vatican decree, the long prayer to St. Michael cannot be said by the laity, as it is taken directly out of the Roman Ritual reserved to priests, and even then only to a priest with the permission of the Bishop may say it. We must be careful not to usurp authority that we don’t have lest we wind up in worse trouble. So it is often best just to pray to Our Lord and Our Lady and the saints to deliver you, and to bind these demons in hell. Our Lady Queen of the Angels, and Virgin Most Humble: Pray for us. In the name of the Father, and of the Son and of the Holy Ghost Amen. On this Quinquagesima Sunday, the last Sunday before the season of Lent, Holy Mother Church makes a final attempt to orient our minds and hearts to the true meaning of this holy season. In the Gospel of today’s Mass, we hear the first reference of Our Lord’s Passion which He is to suffer for our Redemption and the promise of His subsequent Resurrection. And in the epistle, St. Paul admonishes the Corinthians to follow the Lord’s command to abide in charity. We see then, both in the epistle and the Gospel, that the Church is calling us to practice more fervently the supernatural virtue of charity, but also to meditate upon the Passion and Death of Our Lord, Who bore innumerable sufferings for infinite love of us, His sinful creatures. The Church through the sacred text is teaching us that Lent is primarily a season in which we should grow in the love of God and our neighbor and to come to a greater appreciation of the Supreme Sacrifice of Christ on the Cross. The One, True religion of God, the Catholic religion is founded upon the two-fold precept of love of God and love of neighbor; it is fitting, therefore, to consider what this virtue truly is and its importance for us as Roman Catholics. There is no denying that in the past thirty to forty years in the Church, there has been a collapse of catechesis, that is, of proper formation and instruction in the Catholic faith. To such a degree that classes of CCD, have come to be known solely as classes of cutting, coloring and drawing. Burlap banners, banal songs, and a loss of the sense of sin have become the hallmark of these programs of so called Catholic education. All under the mantra that, “God is love.” These mislead souls would want us to believe that because God is love, it is therefore, possible for a man to live a life of sin and debauchery and still be pleasing to Almighty God. But this type of ideology or better yet false theology is both absurd and impossible! For the infinitely Good God can have nothing to do with that which is evil, because it is necessarily opposed to Him, Who as God is necessarily good. It is necessary, then, to first speak about what true Christian charity is not in order to have a right estimation what it actually is. First and foremost, Christian charity is not merely goodwill. Although goodwill is important and the condition and the beginning of friendship, Christian charity is much more than just being “nice” to other people especially if we are only nice to those who are also nice to us. For Our Blessed Lord said, “For if you love them that love you, what reward shall you have? Do not even the publicans this? And if you salute your brethren only, what do you more? Do not also the heathen this?” (Matt. V, 46-47). We cannot fail to forget that the principal act of charity is to love and not so much to be loved. However, our fallen human nature tends to seek to love only those who love us, but as Our Lord says where is the merit in this type of love? True Christian charity seeks union even with our enemies, since charity seeks unity with God for both our selves and our enemies in Heaven. To be clear, then, charity is more than affability (while this is important) even the most pagan of men can be pleasant with his neighbor when he wishes to do so, but this does not require the supernatural virtue of charity. Secondly, charity is not mere social work or humanitarian efforts of relief. Although it is true that a charitable man will manifest his love of God and of his neighbor by exterior works, the proper order of charity must always be observed. If we are eager to help those suffering in other parts of the world to the detriment of those closest to us, then where is our charity? In other words, how is it possible for me to “love” my neighbor in China or Haiti when I fail to love my spouse, children or fellow parishioner? Finally, true Christian charity is not opposed to the truth. To use the words of St. Paul in today’s epistle, “charity rejoiceth with the truth” (1 Cor. XIII, 6). We are completely mistaken if we believe that we are being charitable to others by compromising the truth. To call evil good or a disordered inclination as something natural is not charity, but rather is to participate in another’s sin and puts our own soul in danger of eternal damnation. So much licentiousness and debauchery take place in society under the banner of tolerance, but we must remember that our Christian duty requires us to love the sinner and hate the sin, which on occasion may require us to correct our neighbor. While we can never judge the intentions of the sinner we can judge when duty requires it whether an act in and of itself is sinful. For example, when a woman commits an abortion the act of taking away an innocent life is always gravely wrong, however, we do not know nor can we pretend to know under what conditions or with what intention she committed this act which may mitigate the culpability. Therefore, to out right condemn the woman as a heartless murderer and a woman of ill-repute is rash at the very least. True Christian charity, dear brethren, always seeks to give others the benefit of the doubt. We do so, not by denying the sin or evil committed, but by presuming the best intentions of the other within the limits of right reason. The question still remains, however, what is charity? Charity is an infused theological virtue residing in the will that moves us to love God and the things associated with God for His own sake (propter Deum). This definition is most helpful for several reasons, foremost because it reminds us that charity is above all a supernatural habit, which implies that it must be infused into our souls by God in order for us to possess it. To put it in the words of St. Paul, “The charity of God is poured forth in our hearts by the Holy Ghost who is given to us” (Rom. V, 5). A reminder that we cannot fully love God simply through our fallen human nature, since the act (i.e. of charity) must be proportionate to the object which in this case is supernatural. In other words, to love a supernatural Being we need to do so by a supernatural act. If we love God through nature, we are doing so by a natural love based on what God gives us, namely our existence and sustenance. However, if we love God by supernatural charity we love Him for His own sake. Since charity is a theological virtue, it is clear then, that its object is God, the Divine Good, Who can be known by the intellect alone. And therefore charity as the definition tells us resides in the will whose proper object is the good. This is an important point because we need to realize that once charity is infused into our souls by sanctifying grace it can only be lost by a subsequent act of the will, namely mortal sin. Once we are in the state of sanctifying grace, God does not abandon us unless we abandon Him first. Venial sin does not diminish charity in us, but rather impedes its operation. kindly with the exception of his brother priests in the rectory. Charity begins in the home, that is, with those persons closest to us whatever our state of life may be. Listen to the words of St. John, “Dearly beloved, let us love one another, for charity is of God. And every one that loveth, is born of God and knoweth God. He that loveth not, knoweth not God: for God is charity. By this the charity of God appeared towards us, because God hath sent His only begotten Son into the world, that we may live by Him. In this is charity: not as though we had loved God, but because he hath first loved us, and sent His Son to be a propitiation for our sins. My dearest, if God hath so loved us; we also ought to love one another…If any man say, I love God, and hateth his brother: he is a liar. For he that loveth not his brother, whom he seeth, how can he love God, whom he seeth not? And this commandment we have from God, that he who loveth God, love also his brother” (1 Jn. IV, 7-12; 20-21). Not only will we be charitable towards our neighbor if we truly posses the virtue of charity but we will also possess the effects of charity. The effects of charity are primarily the 12 fruits of the Holy Ghost. Spiritual joy is a particular effect of charity. The more a person loves God, the more joyful that person will be. Why? Because when we possess charity we are oriented to our final end. It is no wonder then that those souls which are steeped in sin or who are stingy with their love are often so miserable and suffer great trials of depression. For they are living their lives for anything, except for what they we created to do, namely to love God. Mother Teresa would often remark, “When I see someone sad, I always think they are refusing something to Jesus.” Is this not us who she is speaking about especially when something does not go as we wish or had planned? Yet, the saints remind us that our sorrow can be converted into joy if we generously offer our trials to God. Not only will the charitable man have joy in his heart, but also peace which is the tranquility of order. Peace will reign not only in the soul of the individual, but also in his relationships with others as long as he generously practices this virtue. The converse is also true, where charity does not reign in the hearts of the people there is neither peace nor joy. It is a clear indication that charity has ceased to exist or at the bare minimum is beginning to fade. For us, Roman Catholics, charity is strongly rooted in that sacrament which we call the bond of charity, the Holy Eucharist. 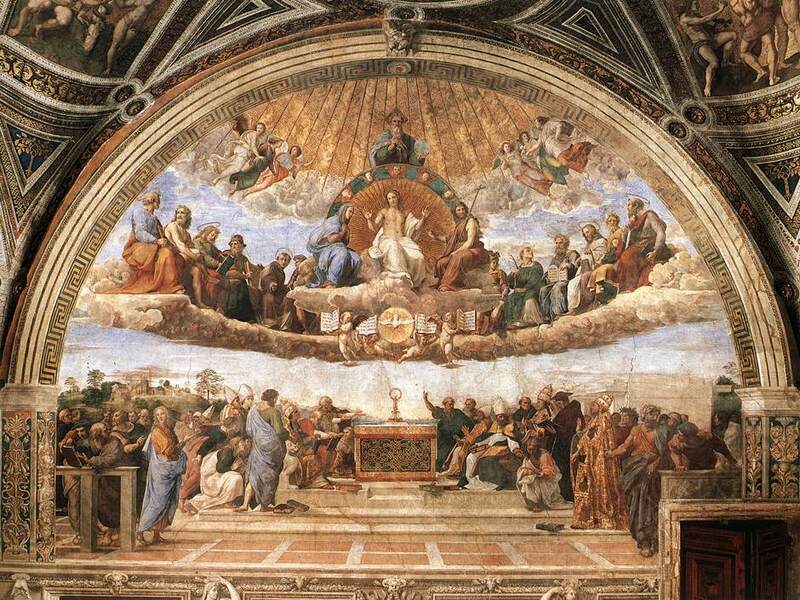 Since it is through this sacrament that we, the members of the Mystical Body of Christ, are truly united to Jesus Christ, the Head of the Church, in His Body, Blood, Soul and Divinity; it follows that the union of the members should grow from their union with Christ in this sacrament. As one Archbishop admonished his faithful, “We too need this charity, we who believe, who have the Faith, who want to stay Catholic and Roman until the last moment of our lives. So we must remain in charity. This Sacrament is the sign and symbol of the love that emanates from Our Lord’s charity. Yet how painful it is sometimes to think that people who nourish themselves daily with the Eucharist never manage to be completely dominated by the virtue of charity! They need to criticize, to form factions, to make rash judgments, to display antipathy towards persons to whom they should show sympathy. Well, then, let us who want to keep Tradition, this holy faith in the Blessed Eucharist, make the resolution today to also keep the fruit of the Holy Eucharist. It does not suffice to believe in it; it does not suffice to say that we are attached to the tradition of faith and hope in the Eucharist without having within us all its fruits” (The Mass of All Time, 143). Domine ut videam, Lord that I may see! These are the words of the blind man of Jericho to Our Lord as He is passing by. They are words that not only display a great act of faith, but also one of humility. As we approach even closer to the holy days of the Lenten season, we, too, should ask Our Lord to grant us the grace to see ourselves as we truly are and our neighbor through the supernatural lens of charity. When there are supernatural problems in the home or even the parish, the solution must be a supernatural one, and that is charity. Charity alone unites us to God and our place in Heaven will be determined by the degree of our love. How much do we realize this? Perhaps not enough, because if we did both you and I would be more earnest in the practice of this virtue. Everything in our life is a response to the infinite charity God has bestowed upon us. We must be convinced that the saints are correct in saying that, “love is repaid by love alone.” In the spiritual life our model is always the divine model, Jesus Christ, Who spared not an ounce of His Blood for our sake and Whose Heart was pierced by a lance. It is to this degree that God has loved us, the question we must ask ourselves is: what has been my response thus far? If we’ve been miserly then now is the time to begin anew. And if we have already begun to be generous now is the time to continue being generous and not to go back, “for God loveth a cheeful giver” (2 Cor. IX, 7). Let us, dear brethren, continue to pray for one another asking God to widen our hearts in order to be quick to forgive any harm we have suffered and to bear our trials with great joy and peace. May we never forget the words of St. Therese of the Child Jesus, “There is only one thing to do during the night, the one night of life which will come only once, and this is to love, to love Jesus with all the strength of our heart and to save souls for Him so that He may be loved!” (With Empty Hands, 16). Can. 1249 All members of the Christian faithful in their own way are bound to do penance in virtue of divine law; in order that all may be joined in a common observance of penance, penitential days are prescribed in which the Christian faithful in a special way pray, exercise works of piety and charity, and deny themselves by fulfilling their responsibilities more faithfully and especially by observing fast and abstinence according to the norm of the following canons. Can. 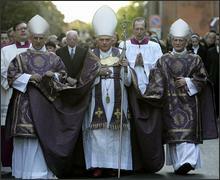 1250 All Fridays through the year and the time of Lent are penitential days and times throughout the universal Church. Can. 1251 Abstinence from eating meat or another food according to the prescriptions of the conference of bishops is to be observed on Fridays throughout the year unless they are solemnities; abstinence and fast are to be observed on Ash Wednesday and on the Friday of the Passion of the Death of Our Lord Jesus Christ. Can. 1252 All persons who have completed their fourteenth year are bound by the law of abstinence; all adults are bound by the law of fast up to the beginning of their sixtieth year. Nevertheless, pastors and parents are to see to it that minors who are not bound by the law of fast and abstinence are educated in an authentic sense of penance. Can. 1253 It is for the conference of bishops to determine more precisely the observance of the fast and abstinence and to substitute in whole or in part for fast and abstinence other forms of penance, especially works of charity and exercises of piety.